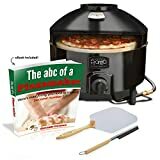 Want to make tasty pizzeria style pizzas at home, but at a fraction of the cost of building a traditional wood-fired oven? Then check out the cool new Pizzacraft Pizzeria Pronto. This highly portable, propane-fueled outdoor pizza oven can replicate the super high temperatures (700°F) of a wood-fired oven, allowing you to bake up gourmet pizzas with crispy crusts and bubbly cheese and toppings in only five minutes. It features dual hollow core cordierite baking stones that diffuse the heat evenly, a reflective heat shield that ensures the toppings cook at the same rate as the crust, and a moisture vent on top to vent steam and prevent sogginess. Unlike a regular oven, this one is lightweight, portable, and safe to use on any surface, which means it's great for tailgating, parties, picnics, camping trips, or anywhere you think some great pizza will really hit the spot. Check out this video to see it in action. Pizzacraft Pronto Outdoor Pizza Oven with Brush and Peel. Two cordierite stones feature a hollow core of air in between, diffusing heat and eliminating hot spots for evenly baked results.